How does a brand new iPhone 6 at £29.89 a month sound? Good? Well, on giffgaff they split the cost of phones and talk plans (aka, “goody bags”) so you need to add on the goody bag you’d like on top of that. If you go for a £7.50 goody bag then you’ll get 200 minutes, unlimited texts and 250MB of data. Swap to a £10 goody bag (these goody bags are rolling monthly ones, so you can swap as and when) to get 500 minutes, unlimited texts and 1 GB data or pay more depending on your requirements. Either way, you’ll need to pay £50 up front for the iPhone 6 and it’s a 24 month contract for purely the handset. If you’re looking to get the iPhone 6 Plus, then it starts at £33.56 a month for 24 months with a £50 up front payment and a £7.50 goodybag. Again you can choose the goody bag that suits your needs. Remember that these “starting at” prices will be for the 16GB versions. If you want more storage you’ll have to pay more. 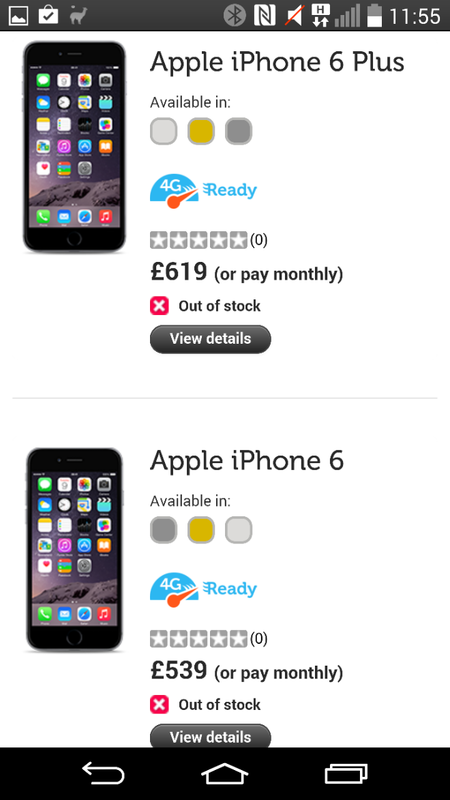 giffgaff now offers iPhone 6 & iPhone 6 Plus. iPhone 6 will be available starting at £29.89 a month for 24 months with an up front payment of £50 and a £7.50 goody bag. iPhone 6 Plus will be available starting at £33.56 a month for 24 months with an up front payment of £50 and a £7.50 goodybag. “We are delighted to be able to offer our members the iPhone 6 and iPhone 6 Plus. Combining these fantastic new phones with one of our great value goodybags is a perfect match” said Mike Fairman giffgaff CEO. In addition, the iPhone 5s is available starting at £27.51 a month for 24 months, with an up front payment of £50 and a £7.50 goodybag. iPhone 5c is available at £20.46 a month for 24 months with an up front payment of £50 and a £7.50 goodybag.